Quick and Easy Projects You Can Make in Minutes. 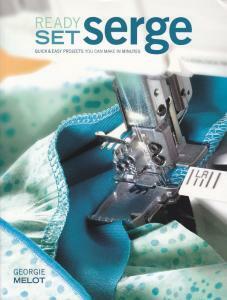 Get a thorough tour of the serger; from how to thread the needles and loopers to identifying specific feet; a guide to serger stitches and what each is used for; fifteen projects in both basic and stepped-up versions so you can learn general skills then add more advanced techniques; clear steps accompanied by photos; project templates and diagrams; and friendly expert advice from a professional serger and instructor. Author: Georgie Melot. Softcover: 128 pages. Made in USA. Keep up the good work. I was happy with my purchases and will buy again. AllBrands.com is an independent dealer not associated with Singer.